Marta Castells (Born in 1969) was born in Barcelona. 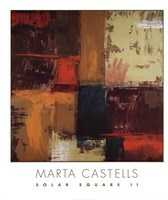 After studying and working in computer sciences for quite some time, she realized painting was her true vocation so in 1992 Marta began her studies in the fine arts. 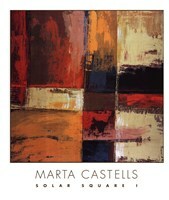 Marta developed her own unique style of painting. She was always influenced by what she observed. She has brought many new and textured mediums to mix with her great sense of light, spacing, and color. These have allowed her to obtain the unique look on her artwork. Marta has exhibited widely in Portugal and Spain. She’s a talented artist with great insight to different eclectic multi-layering of colors, textures, and objects. Her art are a critical and commercial hit, which has made her to be noticed by many. As well as teaching drawing and painting, she also works in textile illustration and design. Her paintings are now much sought after by many private collectors and galleries throughout the world. The recognition her art has stemmed purely from the talent she exhibits. She became an artist for the love of creating. Her work is abstract with references to figurative, still life and landscape subject matter. Her work is featured in many products and publications throughout the world. They can be found in several institutions and in thousands of private and corporate collections. Marta uses unique textures and modern forms to capture color through an innovative use of light and shape. She’s prolific and enthusiastic about her creativity, and she pursued her art with precision, efficiency, optimism and love.